[WIP, Updated August 2018] I first encountered Hong Kong street art back in 2015 when I visited in March when Hong Kong’s art month was underway. There I got to witness street artists from around the world at work creating their murals for the second edition of HKwalls around the Sheung Wan and Central area. 3 years later I returned and HKwalls has run several editions in various parts of Hong Kong since then, and many of the works that I had seen before have disappeared or been updated, which is why I’m updating this post to show you where to head to find street art in the Sheung Wan and Central area of Hong Kong. I have a massive number of photos to edit, so I’m not going to update everything all at once unfortunately, come back frequently to see the latest additions. Most of the large murals you see in Hong Kong are probably due to HKwalls – a street art festival that invites various street artists from local and international circles to take over the walls in Hong Kong’s neighbourhoods with their artwork. Besides Sheung Wan and Central, you can also find their works in Kowloon’s Sham Shui Po and Wong Chuk Hang. Not all the graffiti you see is from this festival though – there are more raw bits of work I’ve tried my best to identify as well. Use the handy dandy menu here to navigate. Looking for things to do in Hong Kong? Here’s a little about shopping and my mixed feelings about Hong Kong, check out my guides to the outlying islands Cheung Chau and Lamma, or see how you can enjoy a local food experience. There used to be more works here during HKwalls 2015, and while there aren’t so many these days, you can still find some gems here, like a surprising Invader mosaic. AFFECT-T, 28 Po Hing Fong Street by Stern Rockwell (USA) for HKwalls 2015 is still there! Facing Tank Lane: Brazilian artist Alex Senna has a drunk or possibly homeless figure with a dog stretched out on the low wall. He left several works in other spots, I’m kinda loving his BnW aesthetic and focus on everyday people. Anyone have other street art spots in Hong Kong to recommend? Share them in the comments here so I know where to go if I ever head back to Hong Kong! Looking for more street art? 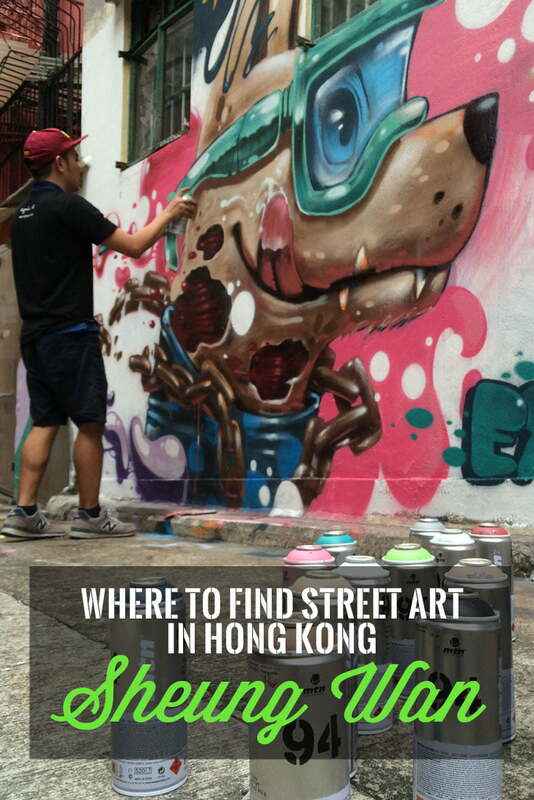 See all my street art guides for various places including Singapore, Asia, Europe and America. Jaclynn, I’m so glad I stumbled upon your ws. I’ve seen a lot of the wall art & always wondered who the artists might’ve been. Thanks for putting an end to my curiosity. I’ve got some pix of more wall art in HK & Spain. Glad you found this helpful :) I love that street art is always evolving and there’s always new things to see! Wow! Your collections of Graffiti from different Countries are great! i do love Graffiti and also have my own collections too. This is a great article and the map is super helpful! Does anyone know if any or most of the street art is still up? I understand with street art that over time it can get painted and drawn over. I am going to Hong Kong end of this month and would love to do my own self-guided tour. Hi i was wondering where to get them spraypaints in hk. sorry that I have no idea, but maybe you wanna try googling or asking street artists based in Hong Kong? cheers! I love the one by Hopare. Awesome shots! thank you! I do love the hopare one too, am keeping an eye out for more of his works around the world! hi, is anyone can tell me where is the colorful, fun houses graffiti in Sheung Wan, which street is that? Hi Peter, do you have a picture of what you are talking about? Or are you referring to one of the pictures in this post? I think the “fun houses graffiti” you mean is the depiction of old-style townhouses on the corner of Graham St and Hollywood Rd. That artwork is given some prominence in a recent e-guidebook which you can download from the Hong Kong Tourism Board website: http://www.discoverhongkong.com/au/see-do/highlight-attractions/old-town-central/crazy-for-art.jsp. The e-book, which has a few pages on street art in the old part of town, can be downloaded from the bottom of that page. I’ll be in Hong Kong for two weeks in November and will look out for any interesting new works while I’m there. Thanks Jaclynn, for your guide to HK art. I’ve already made great use of your guide to street art in Singapore. There should be quite a lot of new works in Hong Kong – HKwalls has been pretty active! Just back home from a fortnight in Hong Kong. The work by Fin Dac which you photographed has been halved. The woman’s face is still there but the man’s face has been removed for new building work. Also much diminished is the nearby Seoul Bros mural, part of which has wiped out by the construction of a new restaurant next door. The “fun houses graffiti” has become iconic. It’s on the wall of the G.O.D. (Goods of Desire) store, which sells various souvenirs bearing its image. Hard to get a photo of it without other people’s smartphones and selfie sticks getting in the way. It’s called Yau Ma Ti Graffiti 2012 and is by Alex Croft. There is now a plaque on the wall to explain its inspiration: the houses of the old Kowloon Walled City. I didn’t spend nearly as much time as I expected exploring HK street art as I’d hoped, but I can recommend the one-hour Accidental Art tours of street art in Sheung Wan on Sundays. Did this tour on my last day in HK. Tours available in English or Mandarin. Even though I was staying in Sheung Wan and had already explored the area, the tour revealed some gems I’d missed, and explained the background of some works I’d already discovered.